Our HeadBed will revolutionise your client's comfort, safety and care whilst the salon sink. 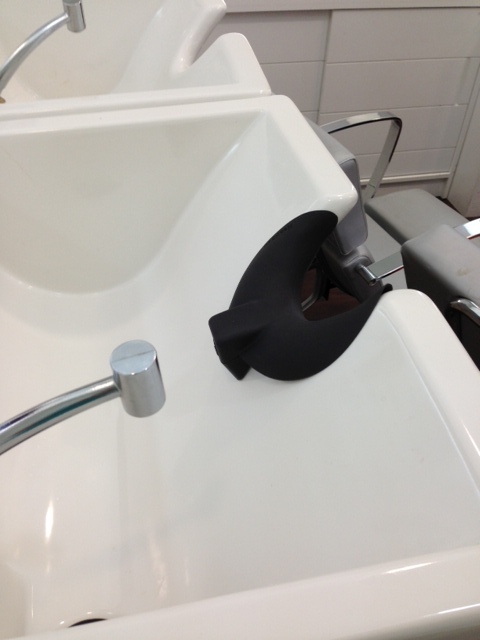 HeadBed is a small head support platform built into a rubber neck cushion that sits on the salon sink. It is designed to support the head at this heaviest point, the occipital bone so your clients can lay back, relax and enjoy pre-service shampoos, treatments and post-treatments. Makes colour removal very easy. "Without support, a person's posture at a salon sink can cause the neck of the client to lie at an unnatural angle and may strain the client's neck, spine and back muscles. Salon Sink Radiculopathy, Beauty Parlour Syndrome or VBI (Vertebro Basilar Insufficiency) was first reported in the early 1990s when an American neurologist identified five patients who suffered strokes as a result of prolonged distortion of their necks from sitting at shampoo wash basins. In 1997, the British Medical Journal, The Lancet published a report by two British doctors about a 42 year old woman who suffered a stroke after having her hair washed. The experts said the stroke was due to a tear in her right carotid artery. "Her head had been extended backwards for about five minutes while being washed and after the treatment she felt numb and suffered slurred speech. If your neck is stretched and it kinks for a long time, as happens during hair washing, you stretch the arteries and if you are unlucky you can tear them," he added. The report continued that "once you have got that tear in the lining, blood starts flowing between layers of tissue and that can cause blood clots to start building up, leading to a stroke." The heaviest point of the head (all 3.8 kgs to 5kgs of weight) overhanging a 'sharp edge' can cause a shearing force on the neck and its delicate blood vessels and nerves. Some people are particularly vulnerable to arterial tears, although there was little way of telling who of your clients might be at risk. How would you know if your clients have high blood pressure, diabetes, are smokers or have raised cholesterol...and are at risk..!!? The carotid artery is the main blood vessel which goes from the heart to the head. It sits on either side, under the main neck muscles (the sternocleidomastoids). The vertebral arteries go along the vertebrae and take blood to the back of the brain, area responsible for speech, vision and balance. Any damage to both these arteries can lead to the formation of blood clots and then strokes. The nerve radicles (small root like branches of the spinal nerves) come out from in between each vertebrae of the neck and they can get pinched and inflamed (radiculopathy). Doctors recommended hairdressers should use a cushion and to make sure the neck is not overextended. 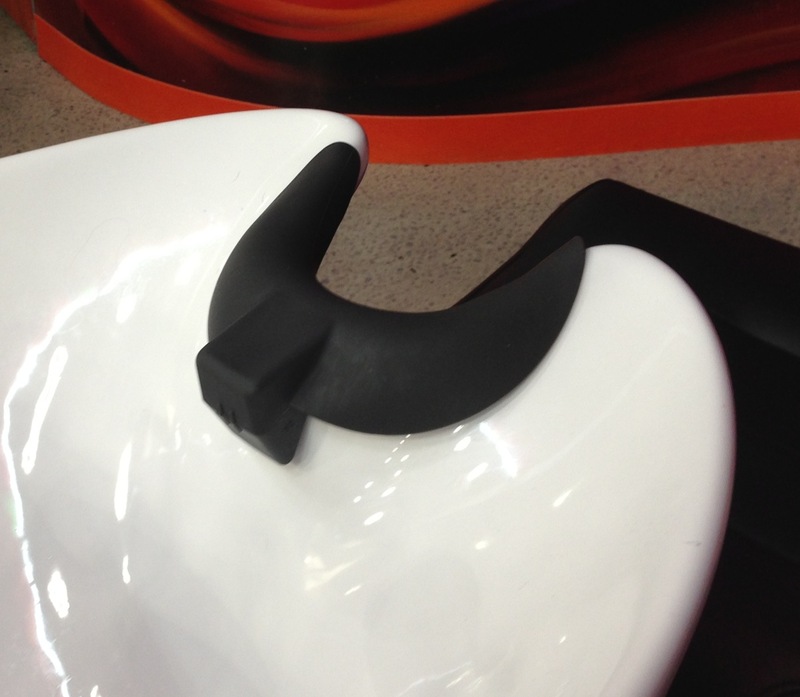 As a result of this recommendation, several neck cushions for salons sinks have been developed, although the designs are not comparable to our unique and ergonomic neck and head support. HeadBed is the only device that supports the weight of the head. The slight padding that these cushions provide is better than nothing, and we were amazed to find that some hairdressers still do not use any neck cushions. They could be at risk of causing their client an injury and open to public liability claims. With HeadBed, the neck is much more protected.